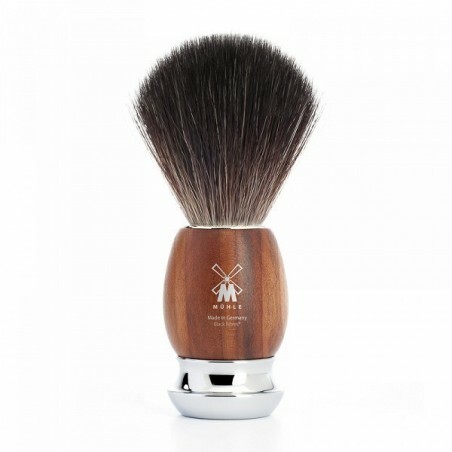 Mühle Shaving Brush Black Fiber, Serie Vivo, Handle Material Plum Wood. The Brushhead - Black Fibre. 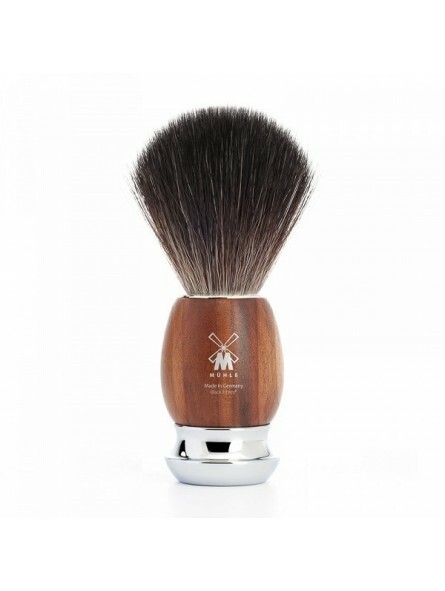 Mühle developed this purely vegan quality specially for wet shaving. In their dark colouring and softness the synthetic fibres largely resemble natural hair material of pure badger quality and are also a little softer at the tips. The synthetic fibres possess equally good performance characteristics. At the same time, the fibres prove somewhat sturdier and more durable. Some users prefer this material not only due to its vegan properties, but also because it produces particularly creamy shaving lather. The Material - Plum Wood. Designers, turners and carvers have long since discovered the wood of the plum tree. They use the material for writing utensils, furniture and musical instruments. Mühle included it in its collection because of its intriguing colouring and vivid grain. Another sustainable advantage is that it is an indigenous wood which is both hard and robust. To protect the wood against water, the surfaces are sealed once again with oil. The resulting soft gleam is a deliberate and highly attractive side effect. Chrome base. The material is corrosion-resistant, very long-lasting and has a luxurious, alluring lustre.